I’ve been looking at ways to try to increase the performance of our CRM infrastructure recently. I followed this Technet Optimisation guide some time ago, but thought it was worth a revisit. The tips here were great when I first configured our CRM environment, but that was almost 2 years ago now! One thing which jumped out at me was the ‘Using Compression Techniques’ section. I remember following this in the past, but the section on ‘Dynamic Compression’ jumped out at me, as I don’t recall following before. It specifically talks about compressing responses sent to SDK clients such as the Outlook client. Standard HTTP compression does not do this, so since a lot of my our users use the Outlook client, I gave it a go. 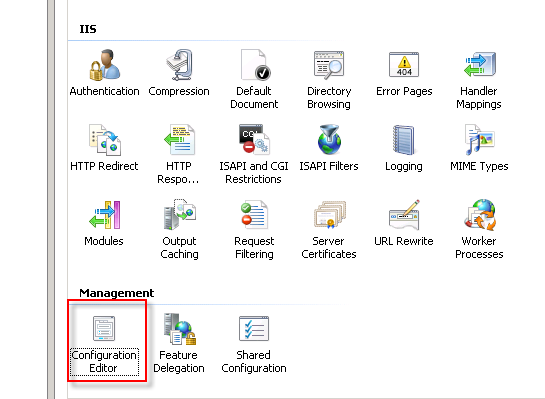 In Internet Information Services Manager, click the <Server name>, scroll down in the Features View to the Management section, and then start the Configuration Editor.